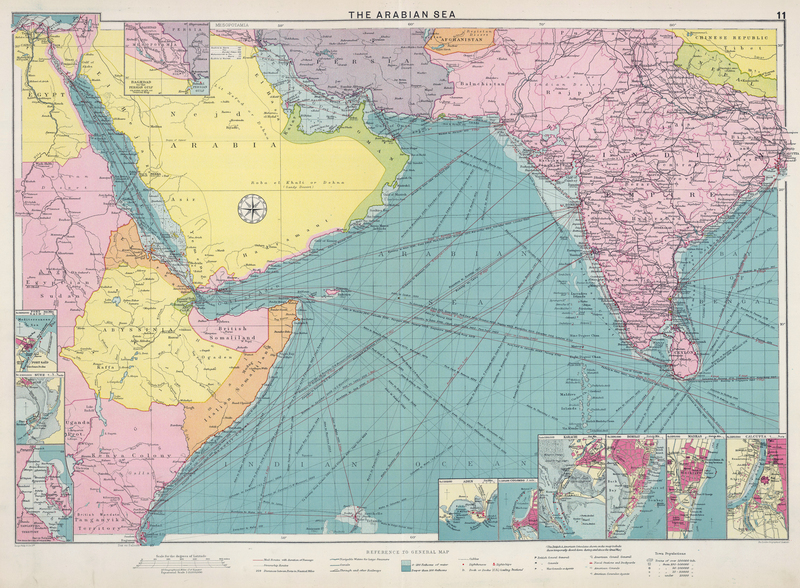 For 300 years Arabia and the Persian Gulf served as a vital link between Britain and imperial India. But from 1908, when the first major oil strike was made in Persia, Britain had an additional and growing interest to protect in the region. It was to bring her into bitter conflict with Arab nationalism and involve her in bloodshed as well as profit. On the morning of November 30, 1971, Iranian gunboats landed two companies of soldiers on three tiny Arab islands in the Persian Gulf off the Trucial Coast of Oman. They met a mixed reception. On the biggest island, called Abu Musa, where a few hundred transient fisherfolk scraped a precarious living, the soldiers were officially welcomed by the local Arab police commander, and within hours they were sitting down to as substantial a feast as the island's modest resources of fish and scrawny chickens could provide. On the smallest island, a rocky protuberance called the Lesser Tunb, their arrival was neither welcomed nor opposed, for the excellent reason that there was no one there. Save for a teeming population of snakes, the Lesser Tunb was uninhabited, and the Iranians, having made a token landfall, departed as quickly as they had come. On the third island however, called the Greater Tunb, where 80 or 100 people lived in the utmost indigence, a crackle of rifle-fire sounded from the local police post, and before the Iranian soldiers could raise their flag in safety, three of their own number and one Arab policeman were shot dead. Intrinsically, there was nothing in these tiny islands to justify any international incident, even on such a petty scale as this; but for many months before the Iranian landings, the island had been the focus of a complex wrangle about historic rights and sovereignty between their ruling Arab sheikhs, the Shah of Iran, and Her Britannic Majesty's government, which, for reasons by then obscure to most people, had once undertaken to protect the Arab claim. By 1971 that protection had been withdrawn and the Shah had exercised the right of force majeure against the sheikhs without fear of British opposition. On the day after the Iranian landings, Britain's senior diplomatic representative in the Gulf was threatened by a hostile Arab crowd, and in protest against what they said was a British betrayal of the Arab cause, Iraq broke off diplomatic relations with Britain and Libya nationalized the local assets of the British Petroleum Company. With these small episodes 150 years of the Pax Britannica in the Gulf were ended and the remaining relics of Britain's empire in the Middle East slid into history. Almost without knowing it, the world had said good-bye to the last, scattered outposts of the Raj. The story of Britain's involvement in the Middle East falls into two main parts, broken by the First World War. The 300 years preceding 1914 were ones of rising British power, when the colonial administration in India, concerned to defend its trading route to Britain, was brought gradually to exercise more and more influence in Arabia and the Persian Gulf. 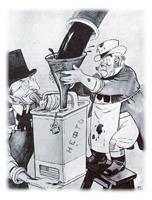 After 1914, British investment in Middle Eastern oil led the British government into conflict with the awakened Arab nationalism of the 20th Century. The first part of the story goes back to the early 17th Century, when Iran, under its older name of Persia, was the mistress of the Gulf and her emperors claimed control of several parts of the Arab shore. In 1619 one of those emperors, the great Shah Abbas, granted the British East India Company a monopoly of his country's silk trade and allowed its factors to settle at the Persian port of Bandar Abbas. For 150 years the Company survived there, a sturdy offshoot of its Bombay headquarters, gradually squeezing out its French, Dutch and Portuguese rivals and extending its commercial tentacles northwards to Basra to dominate the entire Persian coast. But while the Company prospered the empire of the Shahs declined. By the second half of the 18th Century, Persia was sinking into chaos, and threats to the East India Company's supremacy in the Gulf were appearing from all directions. From the east the Afghans had invaded Persia and disrupted its internal trade. Across the Gulf the coastal Arabs had destroyed the last Persian footholds, and an upsurge of Arabian fanaticism, inspired by the Wahhabi Muslims of the interior, was beginning to strengthen their tribal organization and reinvigorate their traditional piracy at sea. In the north the expanding empire of Russia was pressing upon the fragile barrier of the Ottoman Turks, as well as upon the decayed administration of the Shahs, in a first intimation of that Tsarist threat to India which so obsessed the 19th-Century Raj. Further west, in the Mediterranean, the French were also active, probing the Ottoman hold on the Levant in the hope of reopening the old overland route from Europe to India. The British response to these activities was cautious, but consistent. In the late 18th Century and throughout the 19th, Britain's primary imperial concern was to protect her trade-routes to the East, especially to India. And so over 150 years she was led into a steady and, as she believed, defensive extension of imperial control from the Persian mainland to the Arabian shore of the Gulf and thence, by degrees, round the whole Arabian coast until, by 1914, a cordon sanitaire covered the approaches to India all the way from Teheran to Suez. The first British move was inspired by the local threats of Persian instability and Arab pirate raids. In 1763, the East India Company transferred its Gulf headquarters from Bandar Abbas to the more secure port of Bushire, further up the Gulf. There a British official, called the Resident, was installed with an Indian guard. The East India Company was guaranteed a monopoly on the export of woollens into Persia and the Persian ruler promised that no other European nation would be allowed to establish a competing trading station. Here was the origin of Britain's presence throughout the region. The next British moves were a response to foreign intervention - Napoleon's Egyptian campaign to force a way through the Muslim barrier between East and West and outflank the British sea-route to India. Even before Nelson had destroyed the French fleet at Aboukir in 1799, forcing Napoleon to withdraw from Egypt, the British officials in India had acted on their own account, without instructions from London, to seal off the French roads to the East. In 1798 naval units from the Bombay Marine seized the little island of Perim at the mouth of the Red Sea, the first British occupation of any Middle Eastern territory. In the same year, at the exit from the Persian Gulf, representatives of the East India Company signed a treaty of friendship with the powerful Sultan of Muscat, the first British treaty with an Arabian ruler. The pattern of British activity in this region thus established in the closing years of the 18th Century was to persist virtually up to the time of Britain's withdrawal. The pattern had two main features. In the first place, the "British" presence was Indian in origin, control and style. On the western side of the Muslim barrier the British government in London assumed the responsibilities of empire, juggling with the intricacies of the Eastern Question to ensure British supremacy in Cairo and Constantinople and reaching its diplomatic arm far into Central Asia. In the second place, British control was maritime, not territorial - a girdle of sea power round the eastern extremities of the Arab world. Where territorial control of some kind was deemed essential, it was achieved by the traditional British method of indirect influence, rather than direct rule. In the West, the British government secured the same result by supporting the Ottoman Empire against Britain's European rivals and by making the Royal Navy mistress of the Mediterranean. In the East, the Indian administration simply extended its system of protective overlordships from the native states of the sub-continent itself to the petty coastal rulers of Arabia and the Gulf. Apart from the maintenance 'of a territorial sphere ' of influence in southern Persia, nothing more was required so long as the defence of India and Britain's seaborne trade remained the centre of imperial policy. Arabia was, anyway, a notoriously hostile land; and although a few explorers, like John Lewis Burckhardt and Richard Burton, or William Palgrave and Lieutenant James Wellsted, braved its dangers from time to time out of scientific curiosity or a love of adventure, few British travellers in the Arabian interior envisaged - and none found - any means of turning curiosity and adventure to material advantage. "Here is a dead land," wrote one of the greatest of them, Charles Doughty, in his classic 19th Century work, Travels in Arabia Deserta, "whence, if he die not, [the traveller] shall bring home nothing but a perpetual weariness in his bones." It was not the function of the Raj to seek entanglement in such unrewarding regions, nor to extend the Pax Britannica to its warring tribes. As long as the surrounding seas were free and other powers were kept at arm's length from India, the imperial duty was done. Only in one place, around the port of Aden, a paltry 75 square miles, did the British assume the responsibility of colonial rule in these Middle Eastern extensions of the Raj. Elsewhere, they took some 40 or 50 independent principalities into a variety of treaty relationships that made them what Lord Curzon called "loyal feudatories." The treaties embraced many a curious agreement, containing numerous degrees of subordination to British power and many different kinds of British obligation in return. But nowhere was the subordination total. Everyone of the treaties confirmed the local ruler in some measure of independence by restricting Britain's right to interfere in the principality's internal affairs. The first treaty, that signed with' the Sultan of Muscat in 1798, included no formal 'British suzerainty of any kind. The Sultan was generally regarded as Arabia's most powerful ruler. He had overseas possessions in and East Africa, his navy possessed 75 ships of the line, and his agents traded as far afield as the Great Lakes of Africa and the China Sea. His alliance with the British was, therefore, nominally a meeting of equals; and although the equality soon became more fiction than fact - especially when the Royal Navy began to suppress his African trade in slaves - it was never formally gainsaid on paper. By every test of international law he and his successors remained independent rulers, a fact that was to cause many a British official to grind his teeth in later years. Lesser Arabian rulers accepted some degree of vassalage. In the Gulf this merely took the form, at first, of undertakings to desist from piracy. By the end of the 18th Century, under the growing influence of the Wahhabis, Arab piracy had become the scourge of the Persian shore and for the next 50 years its suppression was the main preoccupation of the Bushire Residency. Repeated punitive raids on what came to be known as the "pirate coast" of Oman had no effect and the bold operations of the Qawasim tribe, in particular, mounted from the little port of Ras al-Khaima, remained a tiresome irritant to British traders. Then, in 1835, a new Bushire Resident, Captain Samuel Rennell, replaced the iron hand with the velvet glove. Apart from piracy and fishing, he noted, the only resources the Arabs had were the Gulf's ancient pearling grounds. If pearling were more profitable, he reasoned, the Arabs might be less inclined to plunder. Captain Rennell therefore induced the Arab sheikhs to accept a maritime truce among themselves for the duration of each annual pearling season. As the years went by and profits rose, the truces were extended - from a season to a year, from a year to ten years, and finally, in 1853, to perpetuity. By the Treaty of Maritime Peace signed in that year the sheikhs accepted "a peaceful maritime truce... between ourselves and between our successors respectively for evermore." Thus the pirate coast became the Trucial Coast and the waters of the Gulf were, finally, at peace. The Pax Britannica had arrived, but it was at the invidious cost of making Britain arbiter of all local disputes. To maintain the peace Britain had to defend each sheikh from attack by his neighbours, and to make the peace palatable to the sheikhs in the first place, she had to acknowledge their sovereignty in places around the Gulf where, a century or two before, the Persians had claimed control. In those concessions lay the seeds of trouble when the Empire bowed out of the Gulf 120 years later. The truce was strictly maritime. Inland, the Arabs continued to squabble with what a British political agent of the day described as "that mania for fighting that possesses the Arab mind." British agents held by the rule that events on the mainland were not their concern. 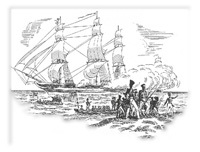 Anti-slavery agreements, for example, were imposed along with the truce at sea as part of the world-wide campaign against the slave-trade; but it was the traffic in slaves, not the institution of slavery, that Britain and the Royal Navy sought to end. True, British agents secured the right to manumit any slaves who applied to them for freedom. And as late as the 1960s they were still occasionally called upon to do so. But to attack the problem frontally by requiring the release of all Arabian slaves would have involved the Raj in a degree of territorial control that it was unwilling, and probably unable, to exercise at that time. Even the defence of India required no more than a negative British influence on the Arabian shore. In the final quarter of the 19th Century, when the possibility of Russian invasion seemed increasingly strong, and successive Vice-regal governments in Delhi trembled for their estate, the British response was to sign another series of agreements with the Gulf rulers giving Britain control of their foreign relations. Rival powers were thus formally barred from the Gulf, from Kuwait to Muscat, without Britain's being committed to any greater physical presence. These defensive arrangements were not, to be sure, secured without some blood-and-thunder- though more thunder than blood. When, in 1899, Curzon, as Viceroy, sent the Resident from Bushire to Kuwait to negotiate the first British treaty with the Kuwaiti Sheikh, he painted an alarming picture of the threat to Empire that might result if other powers got there first and used the sheikhdom as the eastern terminus of a railway from Europe. "Are we prepared to surrender control of the Persian Gulf and divide that of the Indian Ocean?" he asked. "Are we prepared to make the construction of the Euphrates Valley Railroad or some kindred scheme an impossibility of England and an ultimate certainty for Russia? Is Baghdad to become a new Russian capital in the south? Lastly, are we content to see a naval squadron battering Bombay?" Rather, he would "impeach the British minister who was guilty of acquiescing in such a surrender as a traitor to his country." A few years later, the Russians had the temerity to send the cruiser Askold on a tour of the Gulf (greatly impressing the inhabitants, who believed its five funnels to be a sign of great strength) and Britain's Foreign Secretary, Lord Lansdowne, asserted British supremacy with the warning that the establishment of a naval base in the Gulf by any other power would be resisted "with all the means at our disposal." By then the imperial administration in India had made Britain the sole overlord of the Gulf from top to bottom. In the rest of Arabia, meanwhile, the British presence had grown in a similar fashion. At the mouth of the Red Sea the waterless inhospitality of Perim island soon forced the British to look to the near-by mainland for a base. Their choice fell naturally on the superb anchorage at Aden, one of the finest harbours between London and Bombay, and perfectly endowed, therefore, to serve in addition as a coaling station for the East India Company's first 19th-Century steamships. Aden had once been known as the prosperous "eye of the Yemen," a natural port of call on the Red Sea route to the East and the outlet for the fertile Yemen mountains, 100 miles to the north. But after the Turks had conquered the interior in the 16th Century and Europe's merchants had discovered the Cape route to India, Aden had declined into nothing more than a pirate village preying on Indian Ocean traffic. Then, in the 1830s, an army from Muhammad Ali's Egypt invaded the Yemen and threatened to capture Aden. The British decided to act. Local pirates provided a pretext by holding the passengers and crew of a British ship to ransom, and in 1839 Captain Stafford Haines of the Indian Navy landed from Bombay with 700 men and a couple of Royal Naval sloops in support. At a cost of only 15 casualties he annexed Aden to the Bombay Presidency, the first imperial acquisition of Queen Victoria's reign and one destined to carry some flavour of the Victorian Age far into the 20th Century. Haines, who was appointed political agent in the territory, had a vision of restoring Aden to its former commercial glory. And after the Red Sea route to Europe was reopened in 1869, with the inauguration of the Suez Canal, Aden's trade did, indeed, increase. Indian merchants moved in to exploit the new commerce. Indian clerks manned the offices of the new shipping agents, and behind the headland known as Steamer Point, where the P. & O. vessels took on coal, a whole new Anglo-Indian town arose, full of the characteristic wooden bungalows and box-wallahs of the Raj. But to the Indian officials Aden was primarily a military outpost, as Perim had been. They therefore rejected the possibilities of commercial co-operation with the Yemen and chose instead to strengthen the defensive barriers between Aden and the interior by extending exclusive treaties of British protection to all the principal rulers of the South Arabian coast. Not all the sheikhs received the British overtures, and many lesser tribal rulers were ignored (a fact that was to cause trouble for the British in later years, when favours offered to the treaty sheikhs stirred the others to rebellion). 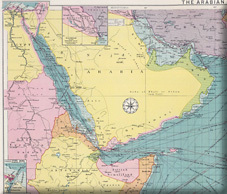 But, one way or another, by the end of the century some 30 ill-defined tribal states between the Red Sea and the Sultan of Muscat's territory in Dhofar had been recognized by Britain, thus creating that curious strip of pink on the old schoolroom maps of Empire known as the Aden Protectorate. What little more was needed to complete the British cordon round the approaches to India was accomplished in the First World War, with the collapse of the Ottoman Empire. 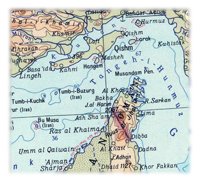 The sheikhdom of Qatar, in the Gulf, was brought under British protection when the last Turkish garrison withdrew in 1916. Sherif Hussein of Mecca, the leader of the Arab Revolt against Turkish rule, became Britain's ally, and his rival, the young Abdul Aziz ibn Saud, ruler of the eastern Arabian province of Nejd and descendant of the Wahhabis, secured a treaty of British protection in return for his help against the Turks. When the Mesopotamian Valley was formally included in the British sphere of interest as a post-war League of Nations mandate, the Empire appeared supreme from the Caspian to Cairo. Yet it was an Empire, not of occupation or administration, but of influence and custom - and these remained respectively as maritime and Indian as ever. For all the proliferation of treaties, the internal life of Arabia's sheikhdoms and sultanates remained untouched. Frontiers were unmarked and tribes were still at war, much as they had been since the days of Abraham. In Persia, neither the eclipse of the Shahs nor the menace of Russia had induced the British to change their indirect authority for direct rule. They had stuck to the principles implicit in the terms of the East India Company's early settlement at Bushire: the protection of British trade and the extension of India's imperial defences. The Company's Resident in Bushire had long since gone, but in his place there was the Indian administration's Resident for the Gulf. In Aden Britain's chief official was also a Resident appointed by the Viceroy. The Resident's staff was recruited from the Indian Army, or even the Indian "civil." Indian soldiers provided ceremonial guards at British legations and consulates in Baghdad, Teheran, Isfahan and Muscat, as well as at the Residencies in Bushire and Aden. Indian Army engineers built their characteristic administrative compounds, Indian merchants ran the trade, Indian rupees were the standard currency and Indian words and customs laid a veneer of Indian culture upon both the Arab and Persian worlds. The Anglo-Indian curry lunch was an accepted Sunday ritual. Every laundryman was a dhobi, every watchman a chowkidar, and every household servant answered to the Anglo-Indian cry of "Bearer!" Three or four thousand miles of Middle Eastern territory - a crescent around the heartland of Arabia - lay securely under the shadow of the Raj. Yet in that post-war moment of apparently unchallenged supremacy, the Raj, in truth, had already passed its peak and in both its Arab and its Persian outposts new revolutionary forces were emerging that would eventually destroy the whole imperial structure. They were those 20th Century twins of Middle Eastern politics - nationalism and oil. In all the long history of Britain's special connection with the Middle East there was never a more momentous document than that to which the Shah of Persia put his name on May 21, 1901, at the request of an Englishman called William Knox D'Arcy. It was the first oil concession agreement of the 20th Century, bestowing upon D'Arcy "a special and exclusive privilege to search for, obtain, exploit, render suitable for trade, carry away and sell natural gas, petroleum, asphalt and ozerite throughout the whole extent of the Persian Empire for a term of sixty years." Although its terms were to be revised, denounced, broken and restored many times by many different signatories long before its 60 years were up, it was the foundation of one of the biggest economic operations the world had ever seen and its results inspired political changes more radical than any the Middle East had known for centuries. At first, the deal seemed unrewarding. Seven years elapsed before D'Arcy got any returns, and his directors had actually sent a cable cancelling further exploration when the news arrived in London in 1908 of an oil strike at Masjid i-Suleiman in southern Persia. In the next year the Anglo-Persian Oil Company was formed with a capital of £2 millIon supplied by a group of British and Dutch financiers. D'Arcy was bought out and work began on the first Middle Eastern oil refinery at Abadan, in the Gulf. The strike could not have come at a better time. On the eve of the First World War the Royal Navy was just completing its conversion from coal- to oil-fired ships and Winston Churchill at the Admiralty persuaded the government to safeguard the Navy's future by acquiring a majority holding in the new oil company. Sixty years later, when Anglo-Persian had become the British Petroleum Company, that holding provided a revolutionary Arab government in Libya with the excuse to confiscate B.P. 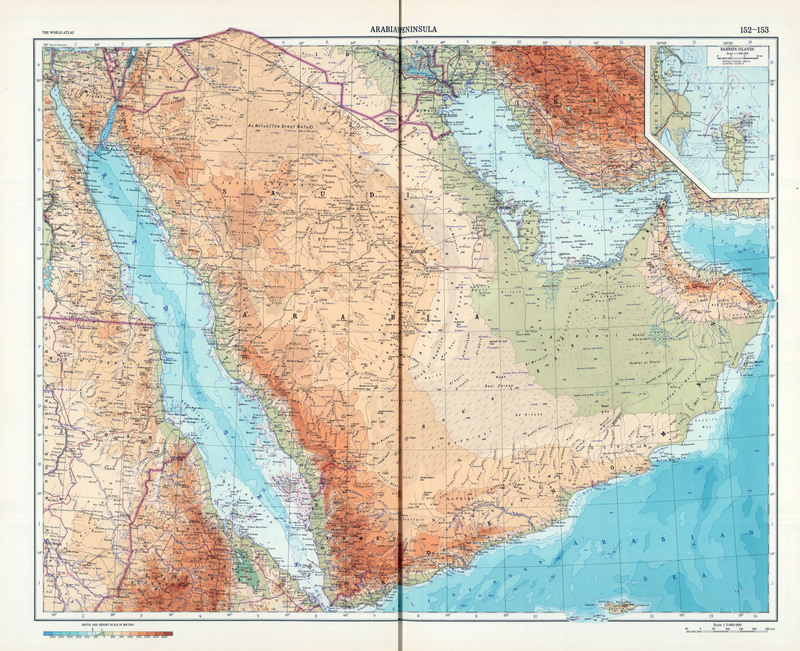 's assets, in response to Britain's final alleged "betrayal" of the Arabs in the Gulf. But at the time, the government's purchase seemed to be a matter of common prudence, on a par with Disraeli's shrewd purchase in 1875 of shares in the Suez Canal. 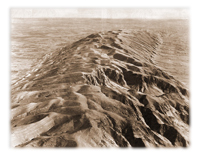 The discovery prompted other countries to seek oil concessions in the area; and in 1914 Anglo-Persian joined with Royal Dutch Shell and a German company to prospect for oil in northern Mesopotamia - the origins of the modern Iraq Petroleum Company. At the same time, the British hurried to plug possible loopholes in their screen around the Gulf by signing yet another series of agreements with all the Arab states, from Bahrain and Kuwait to the Trucial Coast and Muscat, giving Britain the exclusive right to oil concessions in their territories. They were the first indication that Britain would soon switch her policy from maritime containment in the interests of India to territorial engagement for economic gain. The Empire was forced to come to terms with another new and challenging phenomenon encouraged by the First World War - nationalism. In India itself when the war was over, the independence movement began to shake the confidence of the Raj, and in the Middle East the collapse of the Ottoman Empire and the success of the Arab Revolt had started the same fires burning. In Persia, the military coup d'etat of Reza Shah, a former colonel in the Russian Cossack Regiment, suggested as early as 1921 that the days of simple acquiescence in British policy were ending. In Arabia, five years later, ibn Saud asserted his independence by overrunning his old Hashemite rival, Sherif Hussein, and proclaiming himself King of the Nejd, Hejaz and its Dependencies. In the Yemen, too, a new Arab ruler, the Imam Yahya, emerged in the wake of Turkish withdrawal to try to subjugate or suborn the sheikhs of the Aden Protectorate in the hope of restoring the medieval unity of his kingdom. Like the search for oil, these new rumblings from the Arabian interior forced the British to look to the land in earnest. To leave frontiers unmarked and tribes at war in regions nominally under British protection or control was to place both the new oil concessions and imperial authority in jeopardy. So the Indian administration was drawn into the interior at last, in realms far removed from its own, to extend and defend its traditional sphere of interest more rigorously than ever before. From Iraq to Aden diplomatic negotiations with new Arab leaders went hand-in-hand with the pacification of unruly tribesmen and the first attempts at frontier making. The bumbling biplanes of the Royal Air Force dropped bombs on rebellious villagers in Kurdistan, while Indian officials trekked into the Yemeni mountains to talk to the new Imam. Soldiers, surveyors and administrators followed them and a new wave of explorers penetrated parts of Arabia rarely, if ever, seen before by Europeans. St. John Philby went to the unknown interior of the new Saudi kingdom, Bertram Thomas traversed the fearsome desert in the south, known as the Empty Quarter, and Freya Stark entered the secret valley of the Hadhramaut. By the mid 1930s the modern map of Arabia was taking shape and a fitful sort of peace was falling upon some of its ancient tribal squabbles. In the Hadhramaut, where Freya Stark was marooned among warring factions in 1935, a young political officer, Harold Ingrams, was able, only a year or two later, to settle 1,000 years of quarrels almost single-handed. In three years of lonely travel and tribal negotiation between 1936 and 1939, Ingrams obtained the signatures of over 1,300 local chieftains to a general truce that became known, deservedly, as "Ingrams' Peace." At the same time, he signed a new series of treaties with the five major rulers of the area, promising them further British help and protection if they, in return, would accept the advice of the Governor of Aden in matters concerning the welfare and development of their territories. His achievement was significant in two respects. First, because the new treaties were the first to give Britain any right to interfere in the purely internal affairs of Arabia and, secondly, because they marked a transfer from the Indian administration's influence to the authority of Whitehall. Increasingly preoccupied by the independence struggle at home, Indian officials no longer had the energy or the interest to spare for the Arabian outposts of their empire. In 1937, the Colonial Office in London assumed responsibility for the Aden Protectorate and made Aden itself a fully-fledged Crown Colony, with the intention of pursuing a "forward policy" of colonial development and defence to safeguard Britain's interests. But the time was already later than it seemed. The ink was scarcely dry on the last of Ingrams' treaties when the Second World War began. Most of Arabia's frontiers were still uncharted or disputed, many of its biggest oil-fields were undiscovered or unexploited, and most of its tribal life was unaffected by the demands and opportunities of the modern world. For the next ten years the war and its aftermath prevented any rapid change, and when the post-war demand for oil and the renewed challenge of Arab nationalism forced Britain to intervene more decisively in Arabian affairs, it was too late for any so-called "forward policy" to be effective. The rest of the Empire by then was crumbling and British power was in eclipse. Imperial development in the Gulf was even more tardy. Not until the Raj withdrew from India in 1947 was the Resident's post transferred from the Viceroy's staff to that of the Foreign Office in Whitehall and his headquarters moved from the decaying little town of Bushire, on the Persian shore, to the thriving oil sheikhdom of Bahrain on the Arab side of the Gulf. On the Trucial Coast the neighbouring sheikhdoms of Abu Dhabi and Dubai were still at war as late as 1949, firing antique cannon-balls at each other across the sands quite unhindered by the maritime truce their ancestors had signed 100 years before. Not for another three years after that did the British manage to extend the truce from the sea to the land and establish the Trucial States of Oman in something like their final form, when they recognized the little sheikhdom of Fujairah as the seventh and last of the states in the Trucial system and, at the same time, created a local Arab force known as the Trucial Oman Levies later changed to Trucial Oman Scouts to keep the peace along the coast. Once again the motive forces were oil and nationalism, for by then the oil prospectors had arrived in Trucial Oman requiring both protection for their lives against the local tribesmen and defence of their concessions against the threat of external Arab conquest. The Scouts provided both. What they lacked in military weight they made good by the symbolic fact of their presence. With their British officers, romantically wrapped in the flowing head-gear of the desert as they led their camel trains across the great Arabian sand-dunes, they served notice that the frontier which Britain was ready to defend had moved from the Gulf coast into the Arabian interior. They were, in short, the last agents of the Pax Britannica, and in that capacity they had to prove themselves almost at once, when Saudi Arabia decided to enforce a claim to parts of Oman and the sultanate of Muscat by moving its own police force into a remote oasis by the name of Buraimi. The Saudi claim was based ostensibly on the history of Wahhabi influence on the coast, against which the British had fought 150 years before. But its real basis was the search for more oil and its support this time came from far afield, as nationalists throughout the Arab world took up the cause of revolutionary struggle against British imperialism. The Scouts finally threw the Saudis out in 1955, in a bloodless coup de main, but the Buraimi dispute passed into the anti-imperialist calendar, and the memory of it lingered in the Middle East even after the Empire had departed from the Gulf for ever. Thus, in a consistent pattern of challenge and response, the Empire began to assert itself all round Arabia in the first decade after the war. The demands of oil and strategy, the provision of advice and social welfare, the need for economic development, and the extension of law and order - in one combination or another all these drew the British on towards new horizons and new responsibilities. Yet, in spite of it all, these territories in which Britain now sank the last of her imperial energies, remained in limbo. At heart, the Arabian sheikhdoms which the British were trying to protect were still the same lawless places whose "mania for fighting" had been so striking a century before. Few of their inhabitants were ever seen without a rifle, a dagger and a bandolier full of bullets. Slavery was still endemic to most of them; poverty and isolation seemed inbred. Even in those states where oil discoveries had begun to confer vast riches, the follies of the local ruling families, unused to such wealth, were legendary. Girls were imported en masse from Beirut for their harems and gold watches and jewelled bracelets were showered upon casual visitors while their own people looked on in mingled wonder and resentment. In Qatar the ruler was reputed to throw away his Cadillacs when the ash-trays were full, and in Abu Dhabi, where the Sheikh was paid a handsome sum just for the prospecting rights in his territory, the ruler's bizarre behaviour was a permanent headache to his British protectors. His money was paid at his own request in brand-new Indian rupee notes - still the official currency of the Gulf at that time - which he carried off in one of his capacious underskirts to the strong-room of his little mud-walled palace. There he counted every note himself, thrust them into old tea-chests and petrol-tins and locked them out of sight and mind. His people grumbled, his officials went unpaid, and once, when his policemen were on the verge of rebellion, he opened a tea-chest to find the money to pay them, only to discover that weevils had eaten half his concession allowance. In vain did the British Resident in Bahrain send his agents to remonstrate with such men. The new world was not their world and the treaties which their ancestors had signed with the Raj had never required them to listen to British reproaches about the way they should run their own affairs. And so an imperial system constructed for the first half of the 19th Century shambled on uncertainly into the second half of the 20th - an increasingly embarrassing example of British responsibility without power. Of course, it could not last. As the 1950s opened, events elsewhere were sweeping Arabia and the Gulf into the mainstream of international politics and forcing the British Empire into one of the last of its many rearguard actions. In the years of imperial withdrawal which followed the Second World War, few men so nettled the pride of Britain as Dr. Mohammed Mossadeq, Prime Minister of Iran. Tearful, contumacious, hysterical and stubborn, he seemed pre-eminently the sort of man to whom the Empire of old would have given short shrift; and when he nationalized the Anglo-Iranian Oil Company in 1951, it was widely assumed that the dispatch of a gunboat, in the good old-fashioned way, would soon bring him to heel. But though the cruiser: H.M.S. Mauritius, stood by off Abadan with orders to land Marines if necessary, Anglo-Iranian stayed nationalized and Dr. Mossadeq remained in office. 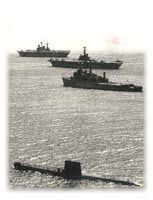 The Marines were never landed, the cruiser was withdrawn, and three years later, when the crisis was resolved, Britain's exclusive interest in Persian oil had been reduced to a small joint shareholding with a number of American companies and Iran had set up its own national oil company, pointing the way eventually to greater independence for all the Middle Eastern oil countries. 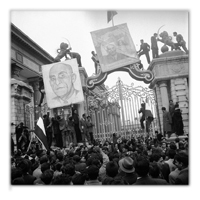 The Mossadeq affair was a blow from which British prestige in the region never recovered. Iran, it is true, suffered from a commercial blockade of her oil exports, and Dr. Mossadeq ultimately lost his job. But he had called the British bluff in the Gulf, and what had once seemed an imposing structure of imperial power was revealed as a rickety facade. In retrospect, this outcome seems to have been inevitable. The withdrawal from India and the abandonment of Palestine had already signalled the approaching end of Empire elsewhere and, although post-war nationalism had made only a fitful impact upon the British-protected fringes of Arabia and the Gulf before the Mossadeq crisis, the competition of the new super-powers was being increasingly felt in those areas. In Saudi Arabia the Americans had secured an oil monopoly before the war, and ibn Saud had slid from the protection of the Raj into the more capacious arms of Washington. 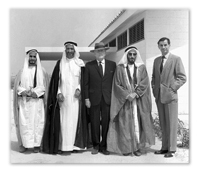 American oil-advisers and the American State Department gave open support to the Saudis in the Buraimi dispute and discreetly penetrated all Britain's commercial strongholds around the Gulf. American companies shared the vast new fields of Kuwait equally with the British and participated, through the Iraq Petroleum Company and its subsidiaries, in all the other Arab oil operations from Mosul to the Trucial sheikhdoms. During the war the United States had taken over Britain's traditional military and political influence in Iran, as a result of the great American drive to get war-supplies into Russia through the Persian back door. When Mossadeq destroyed the British oil monopoly there, the Americans moved in to take over the commercial leadership as well. The Soviet Union was equally active. At the end of the war it had sought fo perpetuate its wartime administration of northern Iran by setting up a satellite People's Republic in Azerbaijan. When American pressure frustrated that intention the Russians turned to the subtler and more rewarding tactic of encouraging incipient nationalist movements throughout the Middle East. Mossadeq himself was spurred on by Russia's Communist allies in Iran; and growing Arab bitterness over the creation of Israel, accompanied by accusations of British and American betrayal, offered Moscow many new revolutionary friends. In the aftermath of the Mossadeq affair, these new rivalries and alliances of the Cold War became increasingly entangled with ancient tribal jealousies and national resentments in Arabia and the Gulf. By then the proven oil deposits around the Gulf amounted to two-thirds of the Free World's resources and, although Britain's share of them had dwindled to only half that of the United States, the profits from British operations there had become vital to Britain's balance of payments and the preservation of the world-wide sterling area. Strategy and finance, therefore, prompted a hard line. As Sir Anthony Eden wrote of a meeting with Nikita Khrushchev in April, 1956, "I thought we must be absolutely blunt about the oil, because we would fight for it." Six months later he did just that, after Gamal Abdel Nasser nationalized the Suez Canal. One of the justifications for the Anglo-French attack on Egypt, Eden said, was the fear that, if Nasser "got away" with nationalizing the Canal, he might thereafter get his hands on Arab oil and, with Russian approval, strangle Britain's livelihood. Even more than the Mossadeq affair, the Suez campaign revealed the futility of Britain's imperial posture in a post-imperial world. The Canal was blocked, the trans-desert pipelines from Iraq to the Mediterranean were blown up, Saudi Arabia refused to pump oil for British (or French) tankers, and there were riots in Bahrain and explosions in Kuwait. For months Britain was forced to endure petrol rationing and the flight from sterling approached the level of a national disaster. When the final cost was reckoned, it included the destruction of nearly all remaining trust between Britain and the Arab world and the abandonment of most of the military bases that had once been established there. Yet, still the British government was unwilling to reverse its imperial policies altogether. The protection of Gulf oil was now as much an obsession in Whitehall as the defence of India had been in Delhi a century earlier, and the troops and aircraft that pulled out of Egypt, Jordan and Iraq were concentrated afresh upon the last remaining British strongholds in the Arabian peninsula. Aden, for so long little more than India's furthest outpost, became Britain's largest overseas military base. The naval units in the Gulf were strengthened, troops were trained in the Oman Desert, and the belated "forward policy" of the 1930s became an urgent drive for military security, economic development and political reform. But the British were running further than ever behind the clock and, paradoxically, the more they tried to catch up, the more they caused events to accelerate out of their control. In its new role Aden Colony grew wealthy and the Indian shopkeepers and Arab landlords of Steamer Point gladly joined the treaty sheikhs of the Protectorate in planning a Federation of South Arabia that would unite the town and the tribes to secure the British base and British patronage - indefinitely. But the same wealth encouraged a new influx of Arab workers, who made a natural seedbed for revolutionary anti-British nationalist sentiment. Outsiders jumped quickly on to the nationalist bandwagon, rolling euphorically onwards now in the post-Suez atmosphere of Arab triumph and British defeat. In the Yemen, the Imam Ahmed, the son of Yahya who had challenged British rule in Aden 40 years before, increased his raids on the Protectorate frontier and appealed to the United Nations for. support. From Cairo the Egyptian radio's Voice of the Arabs maintained a steady stream of anti-imperialist invective, while both the Soviet Union and China took their first, cautious steps into the treacherous quicksands of the Arabian peninsula 's politics. By 1957, as a result of Yemeni agreements signed in Moscow and Peking, Russian rifles were in use against the British on the Protectorate border and Russian and Chinese technicians had arrived to build new ports and roads for the Yemeni kingdom. As a result, the ancient tribal skirmishes of the Protectorate soon engaged more British troops and acquired ominous international overtones. Further east, the pace of change also quickened. 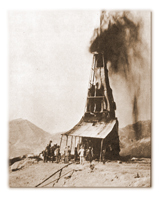 In Muscat the Buraimi dispute spilled over into the remote mountains of the Oman interior, where an historic conflict between the Sultan, on the coast, and the tribal and religious leaders of the mountains was inflamed by Saudi money, Egyptian propaganda and the arrival of the now ubiquitous oil-prospectors. When Wilfred Thesiger, last of the great British explorers of Arabia, arrived on foot, in 1948, at the gates of Nizwa, in Central Oman, he was the first European to see the place since Lieutenant Wellsted of the Bombay Marines more than a century before, and he was promptly sent packing by the local chieftains who feared that he might have come on behalf of the oil companies to steal their land, their wealth and their women. But within a year or two the oil-men were there, anyway, rumbling down from Buraimi in ungainly Albion lorries to set up permanent camp on the edge of the Empty Quarter. The local chieftains scented money and with Saudi and Egyptian help they tried to throw off the Sultan's rule and make their own deal with the oil companies. Once more the British went in, to protect their oil interests and to honour old obligations to the Sultan. 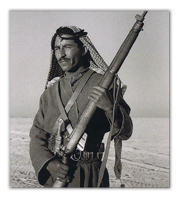 Three times between 1955 and 1959 small British forces joined the Sultan' s men in subduing the Oman rebellion. Like the Aden skirmishes and the Buraimi affair these minuscule sorties were added to the growing catalogue of imperialist crimes in the folk-lore of Arab nationalism and became annual features on the anti-colonialist agenda at the United Nations. By now it was a nice question whether the British presence did not create more trouble than it suppressed. Had the British actually ruled the territories they protected and brought the full weight of enlightened colonial policy to bear upon them, their military actions might have appeared more defensible. But, stuck with the 19th Century treaty system, they seemed more and more to be defending the indefensible, propping up a host of outdated sheikhs and sultans whom the 20th Century ought (according to the then fashionably liberal view) long ago to have swept away. British efforts to change the old tribal ways were restricted largely to diplomatic persuasion and were often rejected with contempt. The Sultan of Muscat, for example, a proud and penny-pinching little man who conceived of practically any change as the devil's work, turned his back on what he considered Britain's half-baked notions of political and social reform. His kingdom, in consequence, remained the most remote and backward in Arabia even after British troops had gone to his rescue. Even where the British were able to induce the local rulers to adapt their style of government to new circumstances, their success sometimes inspired another sort of trouble. 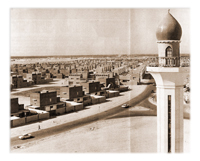 In Kuwait, a wise ruler, Sheikh Abdullah as-Sabah, was persuaded to create a model welfare state for all his citizens and to negotiate his independence from Britain by 1961. No sooner had he done so, than a new revolutionary government in Iraq, under General Abdul Karim Kassem, claimed Kuwait as part of Iraqi territory and advanced its tanks and soldiers towards the sheikhdom. Abdullah as-Sabah turned to the British for aid and reluctantly the threadbare forces of a vanishing Empire were dragged into yet another gunboat action; The commando carrier, H.M.S. Bulwark, landed Marines in July to serve notice on General Kassem that Kuwait and British oil were not for the taking. It was in Aden that the British presence seemed most obviously self-defeating. Ostensibly established to defend the Gulf oil-fields, the post-Suez base in Aden had to devote most of its energies to protecting itself from unrest in the Colony and tribal dissidence in the Protectorate, conditions inspired partly by the very existence of the base. By 1962 it seemed that only desperate measures could succeed; and in September of that year they were duly taken when the colonial government bulldozed through the Aden legislature a Bill to unite Colony and Protectorate in the mutually protective Federation of South Arabia. But once again the British were too late. The next day a group of military rebels in the Yemen overthrew the Imam's regime, proclaimed the birth of the Yemen Arab Republic, and begged for Egyptian help. Within weeks, tens of thousands of Egyptian troops had arrived and both the Yemen and South Arabia were plunged into a multi-sided civil war. In the Yemen, the Egyptians and Republicans, with Russian and Chinese support, were locked in battle with tribal supporters of the old Imamate - who in turn were sustained by money and arms from the Saudis, proclaiming a holy war against Communism and Nasserism on the sacred soil of Arabia. In the south, the British and the Protectorate sheikhs sought alliance with the Saudis and the Yemeni royalists, while the Republicans and their allies helped the Aden nationalists and the dissident tribes to close the British base and destroy the Federation. In the end, practically every party to the conflict was a loser. The Saudi regime was shaken and the Yemeni royal family was eclipsed. The Egyptians suffered five years of humiliation and exhaustion in vain attempts to subdue the hardy mountain tribes; and after Egypt's catastrophic defeat in the Six Day War with Israel in 1967, Nasser was compelled to withdraw all his forces from the Yemen and abandon his republican proteges to the perils of compromise with their enemies. The South Arabian Federation; too, was destroyed and the British were forced to evacuate Aden. By the end of 1967 it was all over. The British forces had suffered some 60 killed and 700 wounded in the hardest antiterrorist campaigning since Malaya and the indignity of their final departure ranked with the retreat from Palestine. There were no friendly 'ceremonies of independence here, only bitterness and the taste of failure. 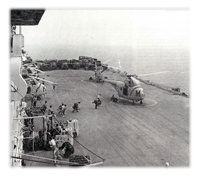 The last British High Commissioner had to be lifted out by helicopter under armed guard to a naval carrier standing well offshore, He left behind the first avowedly Marxist state to take the place of Empire, the People's Democratic Republic of South Yemen, and a city racked by fear and poverty that had come to resemble a ghost town. "Gone Away - No Milk, No Papers," was the message left by a soldier on the wall of Aden's empty prison. The British had, indeed, gone from Aden - but so had tens of thousands of other people, for with imperial collapse there seemed no future for them. The early commercial vision of Captain Stafford Haines had never been realized. Rather, from first to last, through 130 years of British rule, Aden had remained primarily as the British officials in India first conceived it - a military base for the protection of their interests east of Suez. Once the base was closed, its life ebbed away again into the surrounding sands. Soon there was little left to remind anyone of the British occupation save the peeling verandahs of the government offices, erected long before by the engineers of the Indian Army, and an ancient motor bus at Steamer Point, labelled "Ali Baba's Mobile Fish and Chip Shop." Like a golfer scrambling nervously from one bunker to another, the British extricated themselves from the perilous trap of Aden only to fall ignominiously into another in the Persian Gulf. To replace the Aden base they created a vast new army camp in the little Trucial state of Sharjah and justified a general increase in their military forces in the Gulf by the now ritual reference to the need to protect the Free World's oil supplies. By 1968 the Soviet Union had greatly strengthened her influence in Iraq and was maintaining a regular naval squadron in the Indian Ocean. Her vessels visited Arabian ports, like Aden and Kuwait, with a boldness that must have made Lord Curzon tumin his grave. China, too, had sent military and technical advisers into the new Marxist state of South Yemen. And in the Sultan of Muscat's southernmost province of Dhofar old tribal quarrels had acquired a menacing ideological slant in the flourishing rebellion of a revolutionary organization called the Popular Front for the Liberation of Oman and the Occupied Arabian Gulf. To withdraw before such threats seemed unthinkable to the British government of the day, especially when the Americans, in contrast to their earlier attitude to the British presence in the Gulf, were privately urging them to stay. Accordingly, towards the end of 1968, the Labour Prime Minister, Harold Wilson, sent a ministerial emissary to reassure the Gulf states, from Iran to Abu Dhabi, that his government would continue to exercise Britain's traditional overlordship in the interests of all. Alas for such plans, they lay ruined within six weeks. Britain was faced with one of its recurring post-war financial crises. The pound was devalued. And Mr. Wilson announced that the cost of maintaining world-wide military bases had become too great and that the British presence in the Gulf - along with that in Singapore and Malaysia - would have to go by the end of 1971. This revelation of the Empire's bankruptcy set the alarm bells ringing throughout the Gulf and raised strident criticism at home. The Sheikh of Abu Dhabi, by now the lucky owner of vast oil-fields and one of the richest men in the world, offered to pay for the British troops himself. The Conservative Opposition in Parliament promised that they would revoke the decision when they were returned to power. But the Prime Minister's announcement proved to be self-fulfilling. Once made it could not be unmade. For the next three years the only real question to be answered was just how big a mess the British would leave behind. In the end, it was not nearly as bad as many people had feared, despite the fact that Britain's withdrawal exposed once more many Gulf conflicts both old and new. The very news of Britain's impending departure led to fresh unrest by the insurgents. In Dhofar, the revolutionaries stiffened their campaign against the ageing Sultan. In the Gulf, the nine little sheikhdoms still under British protection - Bahrain, Qatar and the seven Trucial states of Oman - joined together in the defensive Union of Arab Emirates, but soon fell to quarrelling. Saudi Arabia let it be known that the Buraimi issue was still open, Kuwait professed satisfaction but nervously sought diplomatic reinsurance from both Iraq and Iran. The Iraqis - with discreet Soviet support - made plain their determination to encourage revolutionary cells throughout the Gulf, and the Shah of Iran made even plainer his insistence that Iran should call all the local tunes. To resolve all these differences within three years and leave the Gulf in a tolerable state of peace was a race against time and history. Luckily, the oil money was now plentiful nearly everywhere and bought off much potential discontent: the traditional Gulf rulers were persuaded to modify their former extravagances in the interests of their citizens. Only the Sultan of Muscat remained unmoved by rebellion, British advice, or the opportunities provided by his own new oil revenues, which had been piling up in his treasury, unspent, for several years. But in the summer of 1970, little more than a year before the British left the Gulf, he was overthrown by his son in a palace coup. As the gates of his kingdom were opened to the modem world at last, the Dhofar rebellion began to look less threatening. It was the Shah of Iran's attitude that proved the greatest difficulty. As ruler of the most populous and powerful of the Gulf states, he believed his destiny to be to regain for Iran the supremacy enjoyed by the Persian Empire in the Gulf before the East India Company arrived. He therefore restated Iran's historical claims to Bahrain, where Persia had once been in command, as well as to the three small islands at the mouth of the Gulf with which this story began. For two centuries the British had regarded these as Arab possessions. Bahrain had its own Arab ruler; the islands were shared between the little Trucial sheikhdoms of Sharjah and Ras al Khaima; all three were members of the new Union of Arab Emirates to which Britain now proposed to bequeath her remaining influence in the Gulf; and for more than a century they had all been under British protection and would remain so until the British finally departed. How, then, was Britain to avoid a clash with either the Shah of Iran or the Arabs - or, in default of British intervention, between them - which might threaten the stability of the entire Gulf? The answer was, in effect, a judgement of Solomon. The biggest of the Shah of Iran's claims proved negotiable. On British advice, both he and the ruler of Bahrain accepted the formality of a United Nations inquiry into the allegiance of Bahrain's people which resulted, as everyone had expected, in the conclusion that they wished to remain under Arab rule. The Shah of Iran conceded that case and Bahrain cut its tenuous links with the other sheikhdoms in the Union of Arab Emirates, renounced British protection, and declared itself fully independent in August, 1971. A few weeks later Qatar followed Bahrain's example. Only the seven Trucial states and the three little islands that belonged to them were left then to bedevil Britain's departure. Here the Shah of Iran was determined to extract a fair exchange for Bahrain. The islands must be his. They were of no value to the Arabs, except for the chance that oil might one day be found beneath their surrounding waters - and he offered handsome compensation against that possibility. On the other hand, because they stood astride the exit from the Gulf, their repossession by Iran was not only historically fitting, but also strategically vital, as a guarantee that they would never be used by hostile forces to blockade Iran's oil exports. If they were not repossessed by agreement, they would be taken by force. Under heavy British pressure, the Sheikh of Sharjah, who claimed the largest island of Abu Musa, accepted a large Iranian pension and agreed to share his sovereignty on the island with the Shah. Thus it was that when the first Iranian soldiers landed there they were greeted ceremonially with an Arab feast. The ruler of Ras al-Khaima, Sheikh Saqr, was made of different stuff. A crusty and wall-eyed gentleman, and a direct descendant of the fiercest pirates of the Gulf, he was the incumbent of the two tiny islands of Tunb which lay nearest to the Iranian shore - and he steadfastly refused to make any deal whatever. In vain did the British remind him that, since they had already given notice of their departure, they could no longer pretend to defend his claim. That, he replied grandly, must be on their conscience: his was clear. Better be bought out than pushed out, repeated the British wearily. Nobler to be pushed out than bought out, was his stubborn answer. And pushed out he was, with that fatal little exchange of fire on the Greater Tunb which announced that the last relic of the Pax Britannica in the Gulf had ended. By tacit agreement between the Shah of Iran and Britain, however, the day chosen for the Iranian landings on the Tunbs and Abu Musa, November 30, 1971, was one day before Britain's withdrawal from the Gulf became absolute. Thus it was the British, bound by their old treaties for another 24 hours, who were made the scapegoat for this blow to Arab pride. It was the last small service of the Raj in the Gulf to accept the blame for the inevitable. Sheikh Saqr duly accused Britain of betraying him, the Libyans seized the assets of British Petroleum in reprisal, Iraq broke off diplomatic relations with London and Teheran, and a few small mobs demonstrated in the towns of Trucial Oman. Honour was satisfied. On the next day the British Resident flew down from Bahrain to the Trucial Coast for a final farewell tour by car and helicopter of the last appendages of his once-proud estate. To each ruler in his sheikhdom the Resident went in turn, with a flowery Arabic speech in one pocket and a formal declaration of British withdrawal in the other. A deskful of exclusive treaties and agreements, many half-forgotten and a few literally lost, were thrown into the wastebasket of history at each stop. With the Sheikh of Abu Dhabi there was no hitch. He had put his qualms about Britain's departure behind him and now, secure in his great wealth and conscious of his new dignity as President-elect of the United Arab Emirates, he accepted the Resident's message with equanimity and sent him on his way with an Islamic blessing. In the sheikhdom of Ajman the aged ruler rose from his prayers to receive the Englishman, saying that what must be done must be done - it was the will of Allah. In Umm al-Qawain, there was a brief and equally resigned ceremony with the Sheikh and his son. In Ras al-Khaima, as was only to be expected, there were a few difficult moments when Sheikh Saqr made a speech about British perfidy and a crowd shouted outside his palace for the Resident's blood. But the Sheikh was an honourable man as well as an obstinate one; and when he faced the crowd and demanded their traditional courtesy towards a guest they fell back shamefacedly and let the ruler lead the Resident, hand-in-hand, towards his car. It was after dark when the Resident returned to the little town of Dubai for the last act. There, in a small suburban villa, he was to meet the seventh of the Trucial rulers, Sheikh Muhammad of Fujairah, known to nearly every Briton in the Gulf by the affectionate name of "Fudge." He was an amiable, but elderly, gentleman of notoriously fallible memory, who had once suggested that the best way for the British to deal with his independence problems was to enrol his little state and its inhabitants in the Greater London Council. In recent years he had spent most of his time amid the modern urban comforts of Dubai in preference to the more spartan environment of his own rocky territory, far away on the shores of the Gulf of Oman. As the British car arrived he was nodding, half-asleep, and when the Resident began his speech it was soon apparent that Fudge had forgotten what the meeting was about. He had never agreed that his British friends should leave, he protested. He had never in his life desired such a thing. With mingled puzzlement and politeness he therefore declined to accept the document of withdrawal. Patiently, Her Majesty's representative reminded him of the unwelcome facts of life, of the announcements and discussions and agreements of the last three years about what must now replace the arrangements of the past century and a half. Mumbling his sorrow and bewilderment, the old man at last gave in. The final instrument of British renunciation was signed, the last Arabic blessings offered and returned, and the Resident stepped out into the darkness again, freed of all his historical burdens. He had worked himself, as well as the British Empire, out of a job.